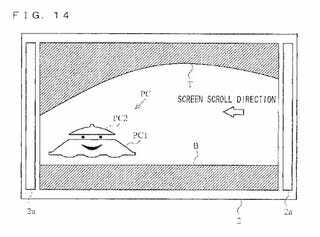 A patent application filed by Nintendo mentions a Wii Vitality Sensor game in which players control the flight of a cartoon character with a combination of Wii remote gestures and - wait for it - breathing. In the patent filing, found by SIliconera, it appears the Vitality Sensor will measure something called your "relax fluid," which is a number derived from a cardiac cycle of 100 pulses. Basically, it's somewhat similar to your Brain Age, so you can measure yourself against persons of a similar age. The measurement game involves piloting that happy-looking blob through a tunnel, remaining careful not to touch its walls. Breathing in and out controls the elevation on his funny-looking top. So the tunnel walls are analagos to some sort of healthy range for a person of your age. The Wii Remote is tilted up or down to assist with the blob's maneuvering. At the end, you get a "relax fluid" score (which just sounds gross) and can compare your progress to previous results. So, that's a Vitality Sensor game. Great. Nintendo's probably got another hit for the old folks homes and hospitals.